If you want to achieve more this year, then you need to make sure that you will do everything that you should be doing. This means focusing on the important tasks, and making the most of your time. Of course, it is easier said than done. There are so many things that can distract you, and prevent you from accomplishing what you need to do for the day. From endless meetings to mindless Web surfing, you may be spending a huge chunk of your time on unimportant things. Make a list of what you need to do for the day. Whether you do it the night before or in the early morning, think of the things you need to accomplish today and the tasks that must be completed. Prioritize based on the needs and urgency of the tasks. You can use a calendar, a planner, a notepad app in your tablet or just a sheet of paper — as long as it works for you. In the course of the day, you may remember a task that you need to do. Get into the habit of writing down what you need to do as soon as you think of them. Just write them down first, and don’t think yet about the order that you need to do them. When you are ready to plan your day, browse your list and look for one that jumps out at you – that is “ready” to be done – and do it. Develop a system that will help you identify what are the things that are important and urgent that you need to do today, and those that are neither important nor urgent that you can postpone for now or choose not to do at all. Do not procrastinate; do it now. 2. Do things to the end. Finish one thing before moving to the next. Don’t let other tasks distract you from the one you’ve started. Minimize multitasking, unless you have the willpower and discipline to finish the most important tasks first. With multitasking, there is the tendency to work on so many things at once and not finishing all or any of them. If, in the process of acting on a task, you think of another task, add it to your list BUT return to the task you are working on. Make all the effort to finish what you need to do first. Once you have completed the task, give it a nice big tick or cross it out on your list. Doing so gives a very satisfying feeling where you feel that you have accomplished something important. 3. Focus, focus and focus. If it helps you, set a timer to help you stay focused. Use tools such as the Be Limitless app for Chrome, which can help remind you to focus on the tasks at hand and help you manage online distractions better. 4. Use faster, better technologies. Invest in technology that can help you work faster and be more productive. Upgrade your computer and other devices to faster models. If you are experiencing fewer crashes and slow downs, you can finish your work faster, do more, and be more efficient. If your business requires that you are on the go a lot of times, get technologies and gadgets that will allow you to do real work outside. Find a system that works best for you, whether that means a tablet, a notebook computer or a laptop. Get your own mobile wireless broadband as well to get you connected more securely. Block or eliminate anything that will distract you, including social networking, music, TV, as well as any chat or instant messaging (except those related to your work). Stop mindless surfing on the Web and avoid productivity traps such as watching viral videos of cute babies or kittens. Give your brain the rest that it deserves, and reward yourself with personal time. Give yourself time where you don’t do anything related to work. Instead, go for a walk, take a nap and rest, watch the scenery, or do mundane tasks such as fold the laundry. You can also exercise to increase your blood flow to the brain, allowing you to focus better. 7. Have an optimized writing or working environment. You can use tools such as iA Writer, or learn to use distraction-free writing in WordPress. Use full screen modes, to eliminate distractions from other open tabs in your browser (better yet, minimize the number of tabs open in your browser). You can also switch to computer systems that allow you to work better and view more information, such as dual screen monitors or bigger screens. 8. Track how much work you are really doing. You can use apps such as focusalot, which helps you track the hours where you’re actually getting stuff done and record how much time you waste. You’d be surprised to know how much work you are really doing. 9. Try to automate your processes and tasks as much as you can. Set up systems that will help you automate some of the tasks that you do. Some examples include the preparation of the same reports over and over again, or entering the same bills in Quickbooks, among others. Instead of manually inputting the same data, getting them automated can shorten the time to complete the tasks. 10. Tidy up your work space. If you spend minutes looking for things and your desk has a foot-high pile of papers, it may be time to clean up. Having a cluttered work space can be stressful and reduces your efficiency. Also, the task of cleaning up your work space can give you the much needed break your brain needs. If you want to achieve more this year, then you need to make sure that you will do everything that you should be doing. This means focusing on the important tasks, and making the most of your time. 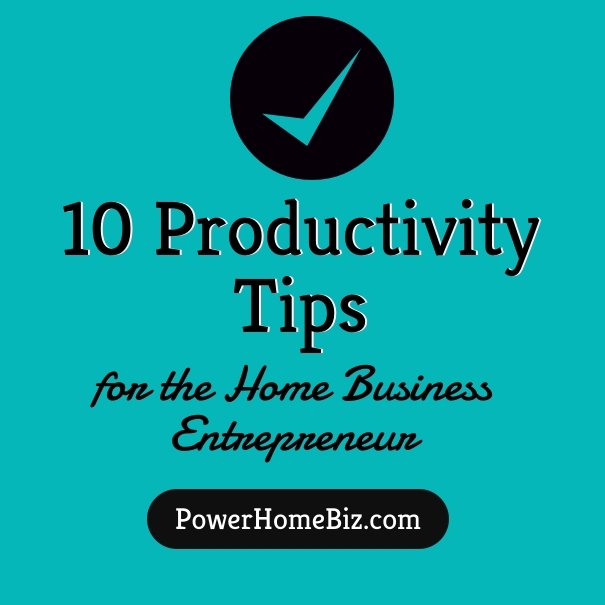 Learn 10 productivity tips this year.